Normally a lot of haunted experience use verbiage to describe their experiences to make it seem more than they are in real life. Not many truly live up to their descriptions, but Zombie Joe’s Urban Death is not one of them. Words that come to mind when thinking of my experiences, having gone through many years now, are: disturbing, twisted, shocking, frightening, ominous, sinister, unsettling, horrific, and SCARY! Every time I leave a performance of Urban Death, I leave feeling slightly dirty and almost as if I was shown the light, if that makes any sense. It’s interesting because Zombie Joe’s does such an incredible job pushing the boundaries of (horror) theater every year with Urban Death, while allowing the underlying message to bleed through. It’s a very difficult balancing act but Zombie Joe and his actors and actresses pull it off perfectly. If you have never been to a Urban Death Tour of Terror before, make this year your first and keep your mind open and ready. If you have been before, get ready for something unlike anything you have seen in years past! 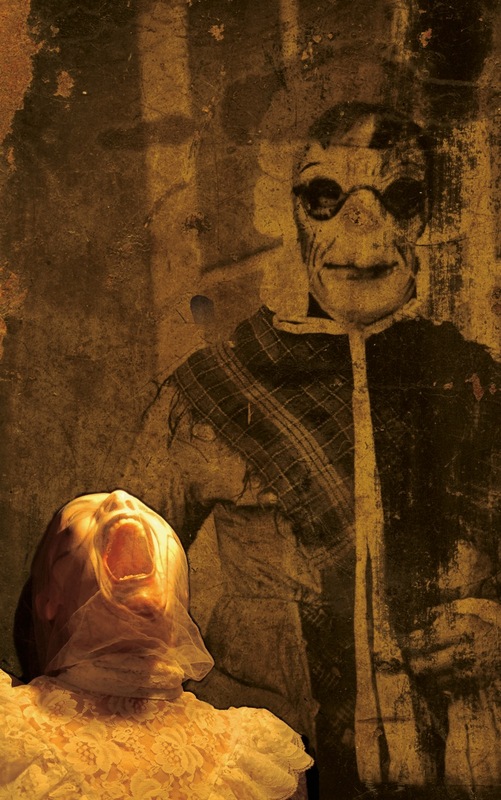 This Halloween season the darkened doors of Zombie Joe’s Underground Theatre Group will slowly slip open and summon guests inside to experience Urban Death: Tour of Terror. The show will run on Friday and Saturday nights, October 6th – October 28th, plus Monday October 30th and Halloween night, Tuesday October 31st. A special press and haunters performance will be held Thursday, October 5th at 9 pm. 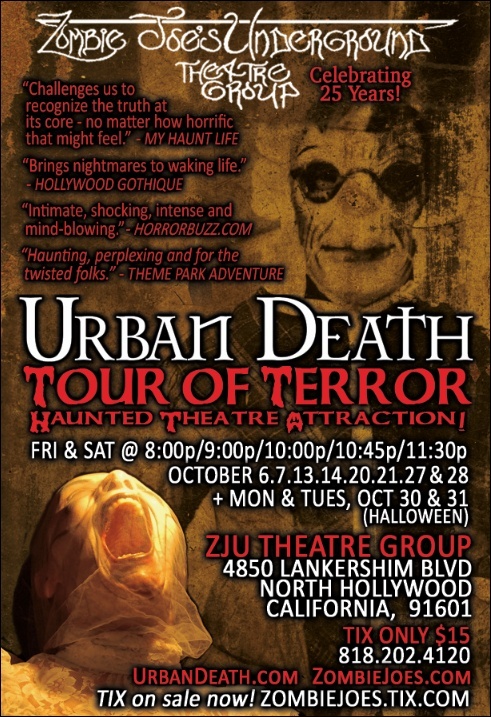 Tour of Terror takes ZJU’s signature show, Urban Death, a series of horror vignettes designed to shock, delight and titillate audiences, and transforms it into an immersive haunted experience. 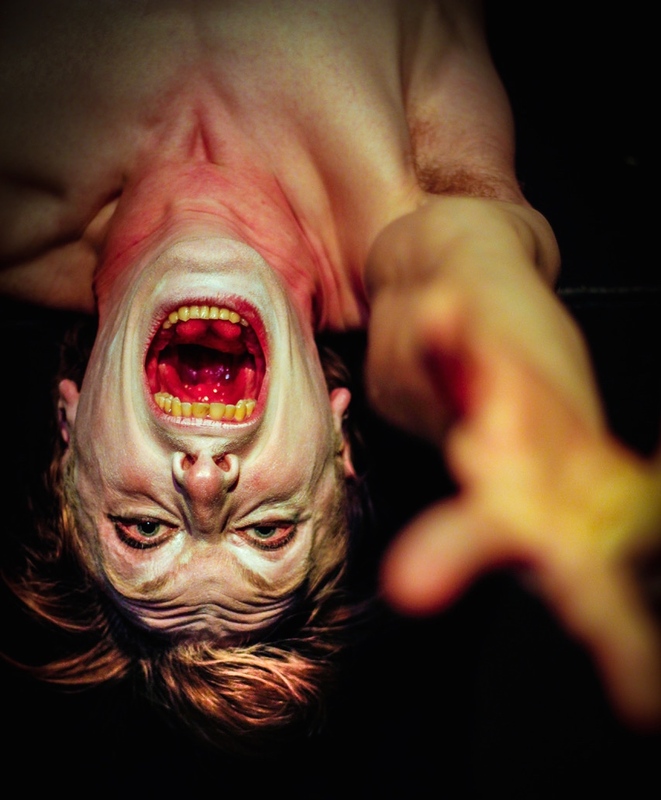 The show will steer theater-goers and thrill-seekers through a terrifying performance and maze of inexplicable horrors, unfathomable monstrosities, and the disturbing spirits that walk among us. The doors to the lobby opens five times an evening as guests are led through the maze in groups of two or three. Guests are provided with only a muted flashlight to guide them. Once through the maze and into the theater the flashlight is taken away and the show begins. After the show they are again given flashlights to walk back through the maze, where new performances and haunted surprises await them. WHEN: Friday and Saturday nights, October 6 – October 28, Monday, October 30 and Tuesday, October 31st, 8:00 pm, 9:00 pm, 10:00 pm, 10:45 pm and 11:30 pm. Special Haunters and Press-Performance Thursday, October 6th, 9:00 pm (please reach out to Zombie Joe at ZombieJoes@gmail.com or 818-202-4120 for comp press tickets).